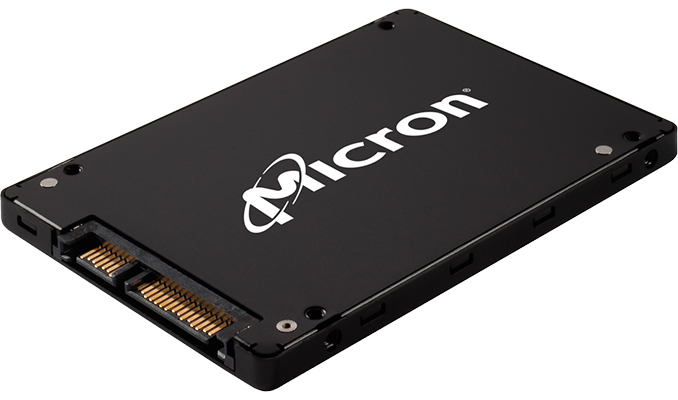 Micron has revealed plans to release datacenter-class SSDs based on 3D QLC NAND memory in an effort to compete in the nearline storage market. Briefly announced at a conference last week, the company is taking aim at applications that currently use 7200 RPM HDDs, the use of which is increasingly common in nearline storage. The manufacturer did not reveal any additional details about the upcoming drive, but demonstrated a wafer with QLC 3D NAND dies. Micron disclosed its plans concerning own-brand SSDs in 2018 at the A3 Technology Live conference in London last week. Among other things, the company intends to introduce a QLC-based SSD with a SATA interface for cloud datacenters this year. The drive will be positioned below the existing 5200-series SSDs and will be aimed primarily at read intensive applications (or the so-called WORM — write once, read many workloads). The QLC-based SSD will have a feature set aimed at hyperscale datacenters and will compete for the place currently occupied by high-capacity 7200 RPM HDDs, reports The Register. The manufacturer did not disclose capacity of the upcoming QLC-based drives and did not reveal whether they will feature in-house developed controllers with enhanced ECC capabilities (developed using IP and engineers the company got when it acquired Tidal Systems several years ago), or third-party enterprise-grade controllers. 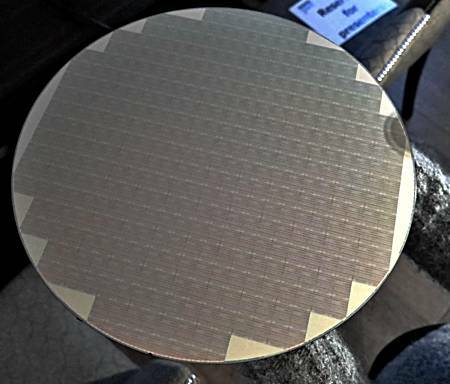 The company demonstrated a wafer carrying 64 GB (i.e., 512 Gb) 3D QLC NAND chips, indicating that it has the new flash memory at hand already. QLC flash memory stores four bits per cell, thus offering a 33% higher bit density and lower per-bit cost compared to TLC flash commonly used for high-capacity SSDs today. 3D QLC NAND has been formally announced by Toshiba and Western Digital so far, but there are no doubts that all producers of NAND are working on QLC chips too. Increasing the bit density of NAND flash usually comes at the cost of endurance, but Toshiba last year said that it had managed to increase endurance of its 3D QLC NAND flash to 1000 program/erase cycles by using a stronger ECC mechanism, which is comparable to endurance of 3D TLC NAND. QLC’s higher bit densities as well as lower per-bit costs are expected to reduce per-GB prices of high-capacity SSDs further and enable them to compete against existing leading-edge HDDs, such HGST’s Ultrastar with 12 or 14 TB capacity. Two obvious advantages that high-capacity QLC-based SSDs will have when compared to hard drives are lower latencies and higher storage densities. Meanwhile, per-GB costs of HDDs will remain lower when compared to NAND flash for years to come — this is what producers of both HDDs and flash memory agree on. So I'd expect to see that these upcoming 3D QLC NAND-based SSDs will sit between high-capacity HDDs and high-performance SSDs, occupying a tier of their own in hyperscale datacenters. You are looking at a 33% reduction in flash price at best vs TLC on the same process. Complexities of manufacturing on the new process may reduce this. Requirements for a more capable controller and firmware to implement the more powerful error correction work against this cost savings. Lets use the current market as an estimator. To remove as many variables as possible, let's look at the an MLC and TLC drive with the same controller from the same manufacturer. The 960PRO and 960EVO are current drives that meet this criteria. I'm going to ignore the small difference in size (this actually makes TLC look better anyways). While TLC nand is able to fit ~50% more data on the same area of silicon, the MLC drive (PRO) only costs 32% (512GB) / 31.25% (1024GB) more than the TLC (EVO) drive. Alternately stated, even though the MLC nand holds ~33% less data on the same area of silicon, the TLC drive (EVO) only costs 24.24% (500GB) / 23.81% (1000GB) less than the MLC (PRO) drive. Given this information it is reasonable to assume that a QLC drive might cost ~18 less than its TLC counterpart.